Although we travel up and down the country a lot and eat out wherever we go we seem to rarely venture into our own city centre of Sheffield. When I mentioned to people that I was going to the new menu launch at The Forum Café Bar the reaction seemed to the same – they didn't know The Forum did food. True, it is situated on Devonshire Street in the heart of the bars and clubs quarter but it really is a food secret that needs uncovering. One thing that would be very easy for a place like The Forum to do would be to serve up a selection of dishes without any real thought or care. If you don't expect a place to do food then you could just put the standard range of burgers and wraps on the menu and have done with it. Here though it couldn't be further from the truth. Whilst there are burgers on the menu they aren't any ordinary burgers. The bread for the buns comes from the local Seven Hills Bakery and for the beef it is sourced just a little further up the road in Ringinglow. So serious is The Forum about food that General Manager, Miles Kehoe and Executive Chef, Andy Burns, went on some field trips across the country to seek out the food trends. As Andy explains, “We noticed on our trips outside Sheffield that one of the fashions seemed to be especially at food fairs seemed to be was Korean food; things you could pick up in your hand and we know at The Forum people like, especially in summer, food that you can pick up in your hand. With such research conducted could The Forum pull off the new menu without disappointing the regulars? The overwhelming response was yes. We started off with the Spicy Sriracha Hummus with pitta chips. This is one of the Small Plates dishes at £3.95 or 3 dishes for £10. This was followed by Baby Backed Ribs with honey and sesame seeds. Also on this selection was the Rarebit Fondue with blue cheese and Bulgogi Beef Steamed Buns. These were all delicious with a good variety of flavours. 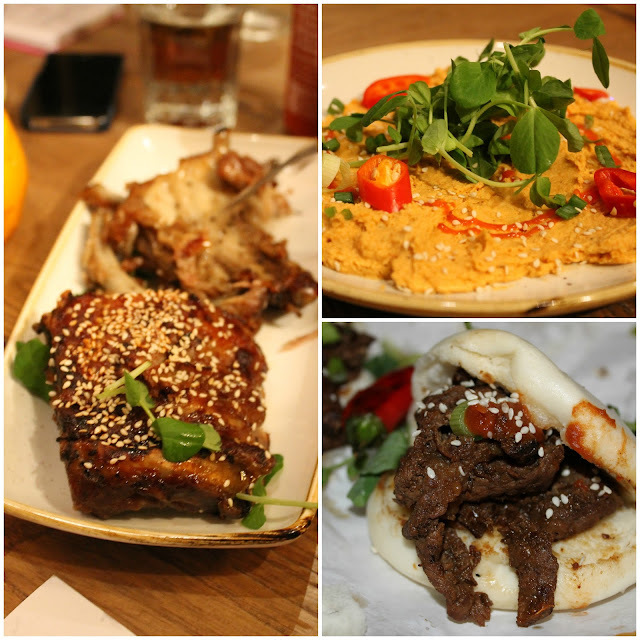 The hummus has a kick to it with the chilli peppers and garlic in it whilst the Bulgogi beef was tender from the soy sauce marinade. A single dish is a tasty snack for one person but together they make a brilliant sharing platter amongst friends. If you're after something larger then there is the Big Plates range. The standout dish for me was the Pork Tomahawk Chop. It's one of those dishes that when it's served up it simply looks burnt. Don't be deceived as it's the soy and ginger glaze covering a huge, tender pork chop. It's served with roasted vine tomatoes and the house fries. A word on the house fries – they are delicious! They have a light dusting of paprika on them and are so moreish you could easily polish several portions off in one sitting. It's a shame they don't sell them on their own. At £9.95 for this dish considering the size and quality of the meat it's an absolute bargain. 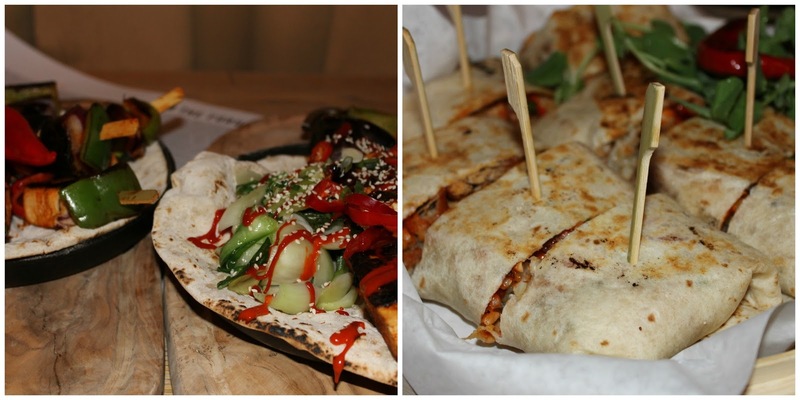 Also on the Big Plates menu is the are the Chicken or Soy Glazed Tofu Skewer and the Korean Pork Belly Burrito. These are both priced at £8.50 and you're getting a lot of food and a lot of flavour for your money. I have to admit by this stage I was flagging quite a bit but can you blame me?! Of course after a short break we were all ready to try the desserts. 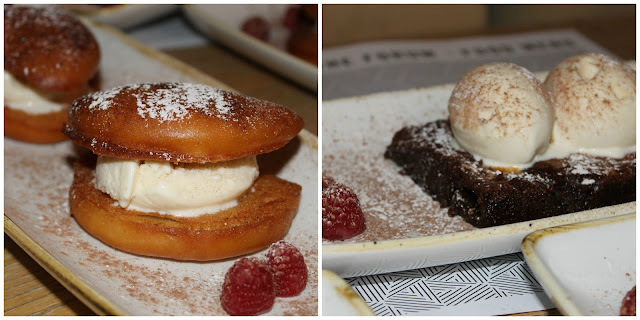 Keeping with the Korean theme was the Deep Fried Korean Ice Cream Sandwich. Don't worry the ice cream wasn't the deep fried part of the dish! My eye though was drawn towards the Homemade Rolo Brownie. Yes, it's rich and yes it's an extremely lardy way to finish off a meal but hey! The raspberries were essential to cut through the intenseness of the chocolate. Before I finish just one note on the drinks. I'm not a drinker so I didn't try out any of the many cocktails that made an appearance on the night. Miles has been working hard on developing some new cocktails of which one was a take on a lemon daiquiri but made with a sweet potato spirit. Sounds dodgy? Well apparently not and my two companions on the night Helen and Anya really rated it. This cocktail hasn't been put on the menu yet and is in need of a name. Suggestions anyone? I was a guest of The Forum. All photographs and views are my own. That looks scrumptious and not far away from me either, will have to visit next time I am nearby.